Our exit to Hwy 59 and the BEACH!!! Burris Farm Market in Loxley, AL is always my big landmark on the way down. They have an amazing produce selection, bakery and even make their own ice cream! We made it!!!! I can still smell the beach air! :( This is the view from our hotel room. 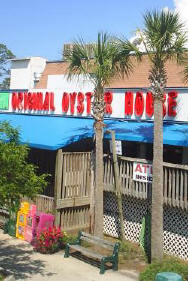 We hit up the Original Oyster House in Gulf Shores for dinner the first night. That was about all we did since we got to dinner about 6:00 and there was a hour and 45 minute wait. So worth it though! There are tons of cute shops on the boardwalk around the restaurant that you can wander into while waiting for your table.